A healthy breakfast means a bowl of cereal. Right? After all isn’t this an American tradition? Nope. It’s actually a very recent marketing invention. A tiny mistake in Battle Creek, Michigan in 1870 changed the face of breakfast forever. Harvey Kellogg (recognize the name?) was the director of a popular health retreat. Kellogg was said to treat his guests with many bizarre experiments for health improvement. One of his invention was a whole grain corn breakfast cereal served to his patients, which he dubbed “Granula” (Prounouced Gran-oo-la). The cereal was made of soaked, boiled corn kernels pressed thru rollers into flat sheets. The sheets were then baked like a cracker, and ground into a crunchy cereal sort of like grape nuts. His “Granula” was tasteless, high in fiber, sugar free, and considered very healthy. One day a surprising mistake happened in Harvey’s kitchen. His chef forgot and left the corn soaking for many hours too long. When he ran the stale kernels through the rollers, the result was tiny separate pieces instead of a solid sheet. The pieces were flat and round. Aha! Like flakes! When he tried baking them they became crispy! Harvey Kellogg called them “Corn flakes”, and they became an instant success with his patients! Harvey Kellogg was a health purist. He refused to allow commercialism or sugar to ruin his healthy cereal. But his brother William bought the company and soon created a winning venture. By 1930, William Kellogg and others had discovered how to process cheap mash at high temperatures in a technique called “extrusion”. The flakes were ingeniously sprayed with sugar to make them sweet and crunchy – forever! Wheaties, corn flakes, and frosted flakes sparked a new breakfast tradition in America! Only problem was – the extrusion process made the cereals toxic and nutritionally empty. Even worse, they were filled with sugar and chemicals. But it didn’t matter. No one was worried about health or nutrition, and the pretty colored boxes made them attractive and fun for children! An early box of Corn Flakes, invented by Harvey Kellogg, produced by his brother William. That was 1930. What’s happening now? 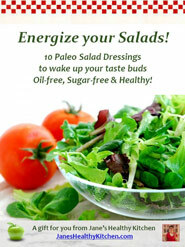 The 21st century has many challenges, especially the epidemic rise in chronic diseases related to diet. Millions of Americans suffer from obesity, diabetes, metabolic disorder, arthritis, heart disease, and cancer. All these diseases are directly or indirectly related to a diet of nutritionally empty processed foods and sugars. As time goes on, the food industry has discovered myriad ways to please our palates with packaged boxed cereals. Even the “healthiest” groceries boast an entire aisle with hundreds of colorful boxes touting their health benefits. They may even be organic. However unfortunately they’re made with a high-heat extrusion process which destroys nutrients, and they contain added sugars under many names. Even granola, which may contain whole grain, is notoriously loaded with sugar. Here are a few examples of ingredients in so-called “healthy” boxed cereals. Look for the sugars in bold. FlaxPlus Flakes: Whole wheat flour, wheat bran, evaporated cane juice, flax, oat bran, barley malt extract (sweetener), sea salt, tocopherols. Newman’s Own, Sweet Enough Flax Flakes: Wheat Bran, Sugar, Oat Bran, Flaxseed, Honey, Salt, Barley Malt Extract (sweetener), Natural Flavors, Mixed Tocopherols. EnviroKidz Organic Amazon Frosted Flakes: Organic cornmeal, organic evaporated cane juice, and sea salt. Health Valley Organic Amaranth flakes: Organic grain and fiber blend (organic oats, organic barley, organic oat bran, organic amaranth, organic corn, organic brown rice), organic cane juice, organic barley malt (sweetener), organic unsulfured molasses (sugar), organic grape juice (sweetener), sea salt, baking soda, natural vanilla flavor, natural vitamin e and ascorbic acid. Kashi Organic Promise Simply Maize Corn Cereal: Organic Whole Grain Corn, Organic Dried Cane Syrup, Salt, Organic Molasses (sugar). Peace Cereal Maple Pecan Clusters: Corn flour (that’s GMO cornstarch) whole rolled oats, cane sugar, rice flour, canola oil (that’s GMO), pecans, Barley Malt syrup (sweetener), Maple syrup (sweetener), Cornstarch (that’s GMO), Brown rice syrup (sweetener), salt, natural flavors (that could mean almost anything), spices. Cascadian Farm Oats & Honey Granola: Whole grain oats, sugar, crisp rice (rice, sugar, sea salt, malt), sunflower oil, whole grain oat flour, molasses (sugar), maltodextrin (sugar), honey (sweetener), sea salt, vanilla extract. Have you ever seen a packaged cereal without sugar? Well, they do exist, but they’re not very popular. After all, we love the sweet crunch of our flakes, pops, and clusters. Problem is, that when we start the day with a bowl of sweets, it sets up a roller-coaster pattern for the day, of blood sugar and metabolic ups and downs. This is the very same pattern that leads to sugar addiction, diabetes, metabolic disorder, arthritis, and our whole host of modern sugar related diseases. Let’s talk sugar. Are you addicted? You’re not alone. These days everybody’s got a sweet tooth, especially for breakfast. Sugar has many names: Cane sugar, evaporated cane juice, molasses, barley malt, maltodextrin, grape juice, agave, maple syrup, coconut sugar, honey, dates, rice syrup – these are all sugars, producing the same rise in blood sugar and insulin response in your body. A recent study found that foods that spike blood sugar are biologically addictive. They noticed that sugar and refined carbs (the very ingredients in packaged cereal) cause a brain chemistry response that is a true biological addiction, lighting up the same areas of the brain as cocaine. Are you hooked on sugars? To find out for yourself, try eating a balanced diet that’s completely free of sugars and grains for a few days or a week. If you feel cravings, mood swings, irritability, or worse, you’ll have your answer. 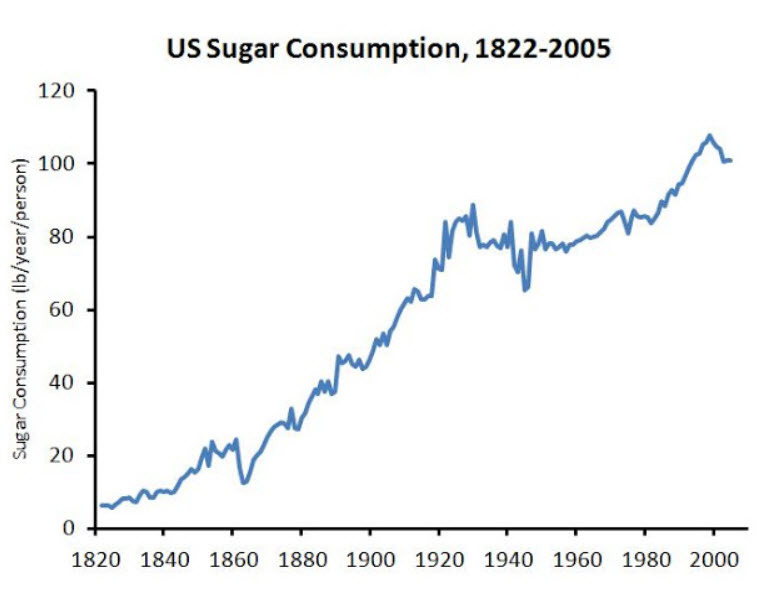 USA Sugar Consumption per person per year 1820 to 2010. Courtesy of Stephan Guyenet. Sugar takes a devastating toll on our health in diabetes, obesity, etc. 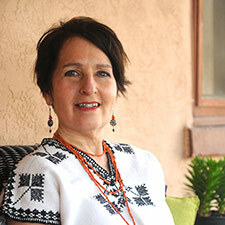 It is at the root of obesity and chronic disease in modern culture. Sugar feeds cancer, triggers weight gain, and promotes premature aging. There are several kinds of sugar molecules, such as glucose and fructose. The human body metabolizes fructose differently, and the burden of metabolizing fructose falls on the liver, where any excess is quickly converted to fat, taking a terrible toll on health. This might help to explain today’s epidemic of obesity and diabetes. As of 2014, Americans eat an average of 130 pounds of added sugars per person per year. Well, we could go back to the breakfast our great grand parents ate, most likely hot cooked cereal made with unprocessed whole grains. I love hot cereals! 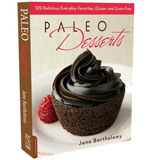 We could go WAY back to the Paleo or Stone Age diet. I thought you’d never ask! I wrote a whole book on hunt-and-gather breakfasts. 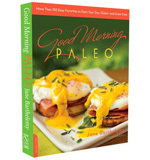 Check it out: Good Morning Paleo, over 150 Easy Favorites to Start Your Day, Gluten and Grain-free. Published by Da Capo Press. It includes a whole chapter of grain-free, sugar-free, unprocessed breakfast cereals that will really wake up your taste buds!